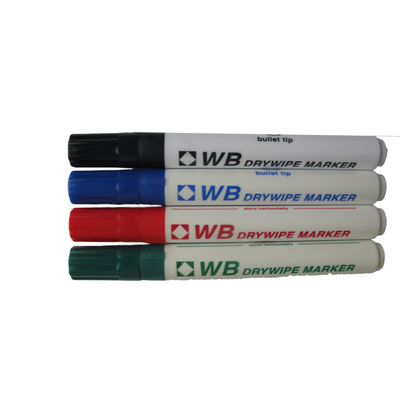 Create engaging meetings and presentations that engage the whole group with our Drywipe Markers Assorted 4pk. These xylene free markers are suitable for use on standard whiteboards and can be easily removed with a dry cloth once the information is no longer required. The low odour ink dries instantly to reduce the risk of an illegible, shiny finish but leaves no permanent marking on boards making them perfect for use in a rented or shared meeting rooms. Each pen is finished with a bullet tip for clear and concise writing. Not suitable for young children. Choking hazard. Our Drywipe markers are also available to purchase in black, ensuring you have the correct tools to present the best presentation or engagement session as possible.